The follow-up film based on Jeff Kinney's illustrated novel will have a Blu-ray release in June. 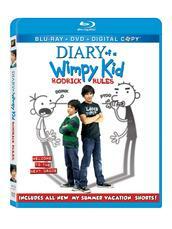 In an early announcement to retailers, 20th Century Fox is working on 'Diary of a Wimpy Kid: Rodrick Rules' starring Zachary Gordon, Robert Capron, Rachael Harris, and Steve Zahn for a Blu-ray release on June 21. Greg Heffley is about to discover that there is something worse than middle school – his own family! Based on the 2011 Nickelodeon Kids’ Choice™ Award for Best Book Series, the original film cast returns to take sibling rivalry to entirely new levels as big brother and little brother wrestle through growing pains. The release will be a Blu-ray/DVD/Digital Copy combo pack with 1080p video, a DTS-HD Master Audio 5.1 soundtrack, and supplements will include: Seven “My Summer Vacation” Shorts (one Blu-ray exclusive), Ten Deleted Scenes (four Blu-ray exclusive), Gag Reel, Audio Commentary, and an exclusive Alternate Ending. You can find the latest specs for 'Diary of a Wimpy Kid: Rodrick Rules' linked from our Blu-ray Release Schedule, where it's indexed under June 21.